Traveling in India is never been so easy with advancements in Domestic Flights and Tourism development. Indian tourism has been developing so fast and there are many Indian Domestic Flights carriers that are providing Domestic Flight services in India. If you want to find the cheap Flight Deals in India, here is the list of Top Indian Domestic Flight Deals Websites in India. We have compiled the top 10 Domestic Flight Deals sites with a link to each of the flight deals websites. You can use these links to get the Flight Deals. Makemytrip also has some of the best tie ups with major banking credit cards and domestic carriers. Yatra and Makemytrip are the leading domestic flight deals websites in the market now. MakeMyTrip flights deals are the best in the industry and Travel Package Deals are some of the best if you are planning a trip within or outside of India. 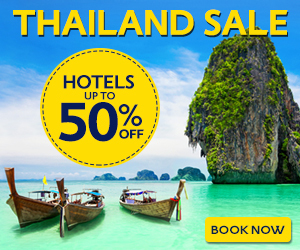 Given below is the link for the MakeMyTrip Booking directly with deals link enabled. Makemytrip recent introduction of nominal fares for Flight change and cancellation of flights is very encouraging. Also having Travel Insurance is one of the best things in India during rainy season. There are always flight delays and having travel insurance helps. ClearTrip is another Top Flight Deals Websites in India which has been very popular for last minute deals. One thing we found quite famous of this website is to give last minute flight + hotel deals and also a lot of cash backs to their e-Cash wallet and Paytm which can be used for future bookings. Their combo offers with the hotel booking is the best in the industry. If you are looking for less conveyance fee, Cleartrip is one of the best to choose. Expedia is not only famous in India but also worldwide. But due to the publicity of Makemytrip and Yatra, Expedia has less popularity. But the last minute and the early flight deals that are provided by this website is something to look for. 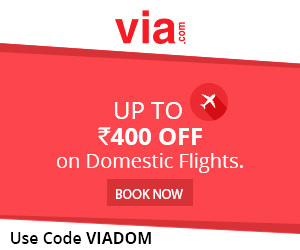 Via is another upcoming Domestic Flight Deals websites in India. It has got good popularity for providing discounts on flight tickets when there is nothing around. 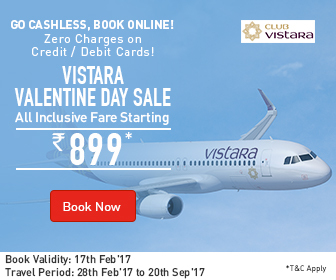 You can check this website as well before buying the domestic flight tickets in India. Enjoy the flexibility of broader seats and free meals in Indian domestic flights from JetAirways. People love traveling in Jetairways as they give comfortable seating and shuffling of seats if available. Also most of the time, meals are free in Jetairways similar to Air India. One can get world class service from Jet Airways. Most of Domestic Flights in India from major cities have Jet Airways. If there is a cost difference of airfare between two domestic flight providers, pick Jet Airways and you will not be disappointed. Paytm also provides best Flight Deals when booking through their App. The way they provide deals is through cash back to Paytm Wallet. You can use FLYHIGH as code when booking through Paytm or FLY by using banner link below. These are some of the best Domestic Flight Deals Websites in India which can help you in getting good discounts during your booking. We will be updating this page continuously with latest Flight Deals Websites and get you information on latest Flight Deals.